A novel mesoporous nanomaterial, namely nano-N,N,N′,N′-tetramethyl-N-(silica-n-propyl)-N′-sulfo-ethane-1,2-diaminium chloride (nano-[TSPSED][Cl]2), was prepared, and characterized using Fourier-transform infrared spectroscopy (FT-IR), energy-dispersive X-ray spectroscopy (EDS), field emission scanning electron microscopy (FE-SEM), transmission electron microscopy (TEM), adsorption/desorption porosimetry (BET, Langmuir, BJH and adsorption/desorption isotherm), thermal gravimetric (TG), differential thermal gravimetric (DTG) and X-ray diffraction (XRD) analyses. Afterward, nano-[TSPSED][Cl]2 was used as a highly efficient and recyclable nanocatalyst for the condensation reaction of primary amides (2 eq.) with arylaldehydes (1 eq.) 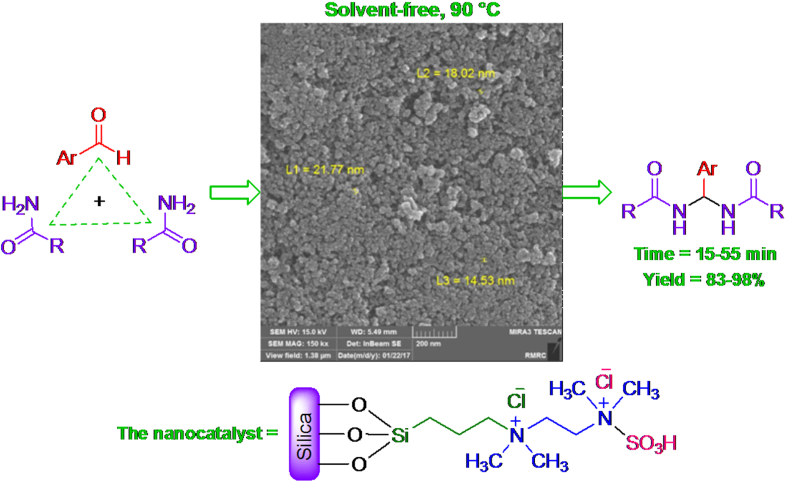 under solvent-free conditions to afford N,N′-alkylidene bisamides in high yields and in short times. 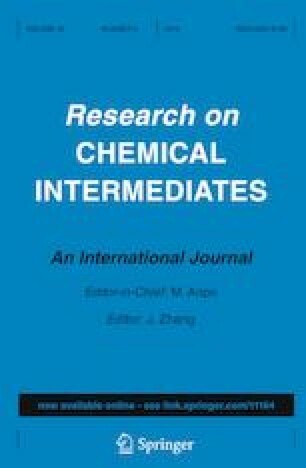 The online version of this article ( https://doi.org/10.1007/s11164-019-03775-7) contains supplementary material, which is available to authorized users. The authors gratefully acknowledge support of this work by Payame Noor University.